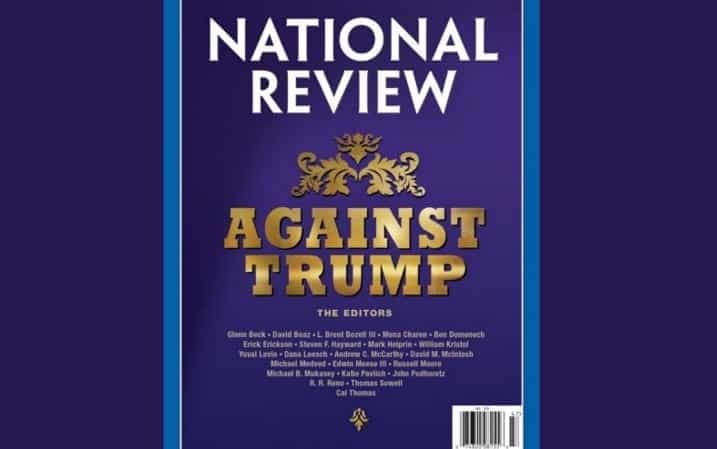 National Review magazine published a special issue on Friday uniformly opposing Donald Trump’s campaign for the Republican presidential nomination, one week before the first primary caucus is held. “Against Trump,” the issue’s headline blares, featuring a bevy of right-leaning writers contributing editorials explaining how the reality TV star would do irreparable damage to conservatism. The symposium features essays from right-wing talk radio icons like Glenn Beck, Michael Medved, and Erick Erickson; neoconservative writers Bill Kristol and John Podhoretz; and TV pundits Dana Loesch and Katie Pavlich. This entry was posted on January 22nd 2016 at 6:38am/06:38 and is filed under Elections, Live News Column 2, Politics. You can follow any responses to this entry through the RSS 2.0 feed.